Age is the biggest prejudice in all of professional sports. It is commonly accepted that once an athlete reached a certain age his or her performance begins to decline as it manifests in how the body reacts to the rigors of competition and how it recuperates from the sport’s grueling physical demands. This is perhaps true for the general mold of athletes, but as in any generally accepted truth in life there are always exceptions to that rule. 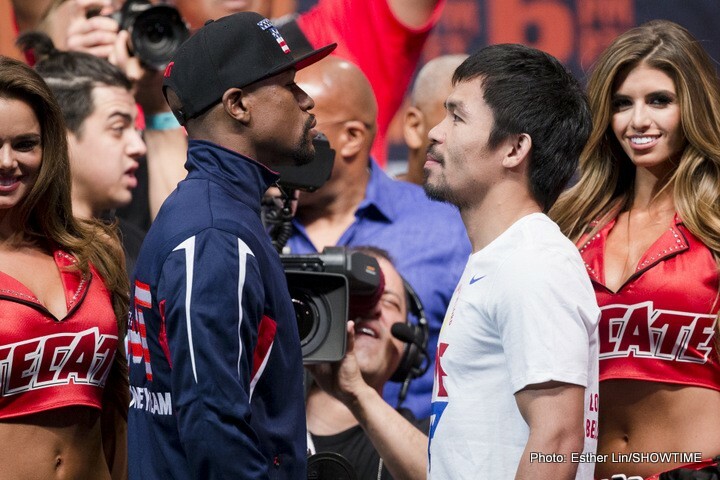 Enter Floyd Mayweather Jr. and Manny Pacquiao, currently two of the world’s best boxers in the Welterweight Division. At ages 38 and 36 respectively, they have proven that they are the exceptions to the general rule of aging in professional boxing. In the last 8 weeks both fighters have put their bodies through extreme physical training that can make an athlete even half their age gasp for air. In recent separate interviews, both Mayweather and Pacquiao have asserted that their respective trainings have prepared their physiques to handle the demands of this historic bout and carry out their game plans to deliver a victory. What is it about these two athletes that separates them from the rest of the crowd? The physical aspect of their game is only a part of it, another critical factor is the mental side of their preparations. At the heart of any mental edge lies each individual’s motivation. For Mayweather as he unapologetically declares in the past it is the fame and the vast amounts of fortune that comes with his fame. His mastery of his craft has afforded him unmatched success and an extravagant lifestyle that has become the envy of young, impressionable men and women who covet even just a sliver of a taste of Mayweather’s ostentatious life. This attention seems to feed Mayweather’s need for adoration from his young fan base. For Pacquiao’s part it is his continuous glorification of his religion’s God that gives him the extra incentive to do well. As a result, he too has gained unparalleled fame, fortune, power and influence that transcends the boundaries of his native Philippines. As a consequence of his considerable fame and fortune is an opportunity to help and inspire millions of his countrymen by bringing into light the difficulties of his humble beginnings. Pacquiao himself believes that “there is hope when you dream.” Two men achieving fame and fortune through two very contrasting approaches and means of motivation. Undoubtedly the overarching motivation for both fighters, however, is the chance to cement their legacies in the sport of boxing. Already touted as future Hall of Fame inductees, there is no doubt that on May 2nd both Mayweather and Pacquiao will step into the ring with enough preparation and motivation to outlast the regulatory 12 round limit for the bout. Perhaps the victor of the contest will be determined by the very same factor that has separated the greatest enduring athletes in all of modern sports. Just to name a few of these luminaries; basketball had Michael Jordan, baseball had Derek Jeter, soccer had David Beckham, hockey had Wayne Gretzky and tennis had Roger Federer. The common trait that has made these phenomenal athletes is enduring heart that drives an athlete to play the extra match, game or fight the extra bout. Pacquiao on the other hand is ruled by his heart for his desire to inspire those who needs to find hope. Fame and fortune can both lead to power and influence. However, fame and fortune as we know fleets over time, but true power and influence can outlast the last cent if people continue to believe and hope for inspiration. If the winner of the fight were determined solely by that source of motivation, then it’s not even a close fight. The reality, however remains to be seen in just a few long hours.